7-5-5 Select Organics® All-Purpose Fertilizer. Net Wt. 3 lbs. (1.36 kg). 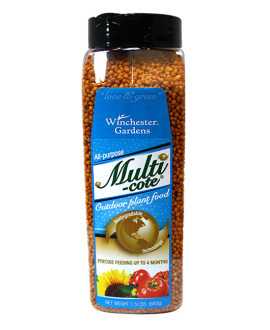 Winchester Gardens Select Organics® All-Purpose Fertilizer naturally encourages your plants to thrive. 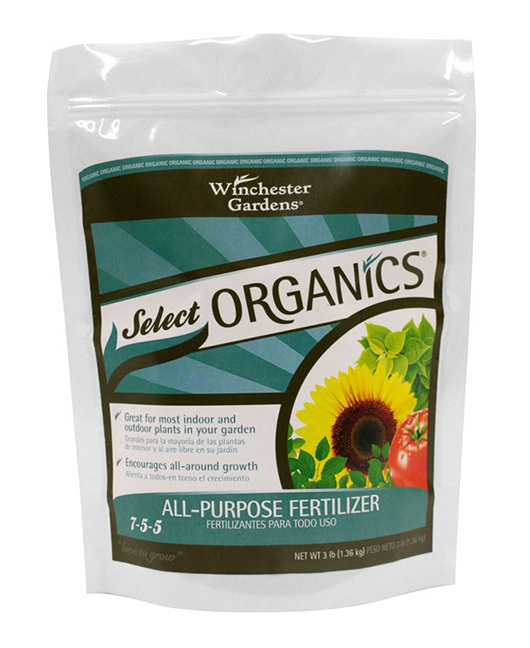 Winchester Gardens Select Organics® All-Purpose Fertilizer is formulated with all-natural ingredients for immediate and long term results. Enhanced with calcium, our fertilizer will help improve soil quality and keep your plants healthy. 1. For bedding plants, apply 2 tablespoons of fertilizer per square foot of area, or 1 cup per 8 square feet of area. 6. 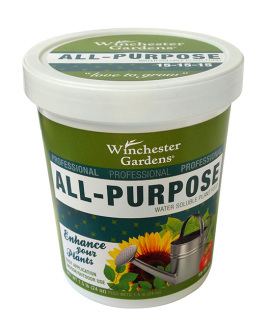 Winchester Gardens All-Purpose Fertilizer is best used at time of planting or early in the season. Repeat every 6-8 weeks or as necessary.